So..........I wasn't very impressed with the Black Friday sales and offerings this year. But you know, maybe it's me being a little too hopeful and just a tad bit naive, but I really thought we were going to see some serious deals this 1st day of serious holiday shopping. Especially with the economy in the pits right now, I assumed the retailers, both online and physical locations, were going to be really creative and entice us with their super sales to boost consumer spending........ I personally didn't experience that. Now, the sales were pretty fantastic for our techno lovers but here at Fashion Pad we hunt for savings in the fashion arena, not the electronics department. Oh well, I still bought a couple of items anyway. You can check them out below. Finally! I forgot all about my love for this sandal. I usually wouldn't pay this much for a trend (studs), but I don't care! I will rock this heel until I feel like it's time to retire it. LOL! 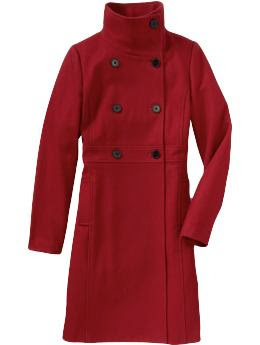 I've wanted a long wool coat and this weekend I decided to scoop up this candy apple red coat at Old Navy. Love's it! I didn't actually buy this one yet. I placed it on hold yesterday becauseI'm debating if I want a bomber that hits just above the hips or this cropped one above. I'm too excited!!! 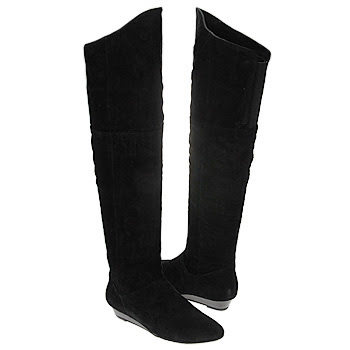 I bought these in black like the photo above from Amazon. They were, by far, the cheapest price on the web (as far as my search goes). Well, I hope you divas and dudes had a better shopping experience than I.......although, looking at my purchases, I'm not really too disappointed.